Sinn Fein President Gerry Adams has dismissed the Government's insistence that Brexit will not prompt a vote on Irish unity, claiming the EU referendum has left the island facing an "entirely new dispensation". The veteran republican also welcomed remarks from the leader of the Republic of Ireland's main Opposition party - Fianna Fail's Micheal Martin - voicing support for a potential border poll in the context of Northern Ireland voting to remain in the EU. Mr Adams reiterated the need to examine "new relationships on the island" after newly appointed Northern Ireland Secretary of State James Brokenshire used his first engagement in Belfast to stress that the referendum result in the region - 56% backing Remain - did not provide adequate reason to call a vote on reunification with the Irish Republic, an EU member state. "They ruled out lots of things in the past which are now a reality," said Mr Adams in response. "The fact is we are now in an entirely new dispensation given the vote to leave the EU and given the fact that the people in this part of the island voted to Remain." After a visit to Belfast City Hall, Mr Brokenshire, a Remain campaigner in the referendum, also rejected the suggestion that Scotland or Northern Ireland could somehow maintain their relationship with the EU, despite the rest of the UK leaving. "I think it's difficult to see how that would work, we do need to move on now, I think that we do need to focus on the best possible outcome for Northern Ireland as part of the United Kingdom outside the European Union," he said. Stormont's Sinn Fein Deputy First Minister Martin McGuinness said Mr Brokenshire needed to understand that people in Northern Ireland and Scotland voted in "big numbers" to stay within the EU. "That cannot be disregarded and under no circumstances do we intend to backtrack from the strength of that vote," he said. On a visit to Scotland last week, Prime Minister Theresa May stressed the need for a "UK approach" to be agreed before Brexit was triggered. Asked if she interpreted Mrs May's remark as a potential Scottish veto on Brexit, First Minister Nicola Sturgeon said Scotland was now in a "very, very strong position". 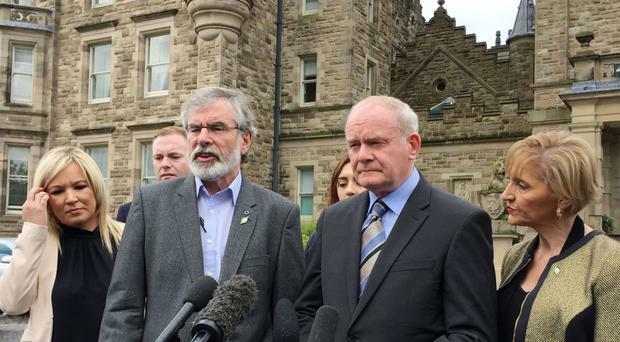 Mr McGuinness referred to the same comments as he flanked Mr Adams outside Stormont Castle, Belfast on Monday. "Theresa May said in the aftermath of the meeting with Nicola Sturgeon, and Nicola quoted her over the course of the weekend, that she would not trigger Article 50 of the Lisbon Treaty unless people in these areas were content," he said. "Well I can tell Theresa May, and I did tell her when I spoke to her on the telephone last week when she rang me, we are not content." He added: "The people of Scotland have made their position clear, we have made our position clear - that needs to be respected." While a majority backed Remain in Northern Ireland, the region's largest party and Sinn Fein's partners in government - the Democratic Unionists - campaigned for a Leave vote. That has rendered it virtually impossible for the Stormont Executive to adopt a united approach on the issue. First Minister and DUP leader Arlene Foster insisted Brexit had opened up great opportunities for Northern Ireland. "Instead of trying to cause instability we should look at this as an opportunity for Northern Ireland to do things differently and indeed the whole of the United Kingdom," she said. "That's what I think is a very exciting part of where we are now in politics in the United Kingdom." Mrs Foster and Mr McGuinness are due to speak with Brexit minister David Davis on the phone on Tuesday. Under the terms of 1998 Good Friday peace agreement, the power to call a border poll rests with the Secretary of State. But the accord stipulates that such a vote can only be called if there is evidence of a clear shift of public opinion in favour of Irish unity in Northern Ireland. Mr Brokenshire said that was not the case. "There is a clear constitutional settlement in relation to the border poll and it's also clear to me that opinion does not support a change," he said. "Clearly we act on the basis of consent, but I strongly believe in the Union - the real strength that the countries of the United Kingdom have together." Mr Brokenshire said he acknowledged that different parts of the UK voted to Remain, but he said the outcome of the vote as a whole had to be respected. On Sunday, Fianna Fail's Mr Martin said he hoped Brexit would move Ireland closer to reunification. He said a "reunification referendum" should be called if it became clear a majority want to see an end to Irish partition over the UK decision to pull out of the EU. Mr Adams welcomed the comments. "I think it's important that he has taken up that position," he said. "All of us who want Irish unity need to become persuaders for that. "I think there are opportunities for everyone to look at new relationships on the island." Mr Adams also encouraged Irish Taoiseach Enda Kenny to push ahead with his plan for an all-Ireland forum to discuss the fall-out from the Brexit vote.